This study was conducted as part of the Federal Highway Administration’s Long-Term Bridge Performance (LTBP) Program. The LTBP Program is a minimum 20-year research effort to collect scientific performance field data, from a representative sample of bridges nationwide, that will help the bridge community better understand bridge deterioration and performance. The products from this program will be a collection of data-driven tools, including predictive and forecasting models that will enhance the abilities of bridge owners to optimize their management of bridges. This report is intended to provide a comprehensive definition of bridge performance that will be the foundation for carefully designed research studies in the LTBP Program. The report describes the barriers and complications that hinder the understanding of bridge performance and identifies the measures by which bridge performance is currently defined. The report divides bridge performance into specific issues, identifies the most critical issues, and describes the types of data necessary to analyze these issues. This report will be of interest to engineers involved with research, design, construction, inspection, maintenance, and management of bridges as well as to decisionmakers at all levels of management in public highway agencies. FHWA-HRT-13-051 2. Government Accession No. 3 Recipient's Catalog No. John Hooks (JM Hooks & Associates) and Dan M. Frangopol, Sc.D. h.c. (Lehigh University) 8. Performing Organization Report No. Piscataway, NJ 08854-8058 10. Work Unit No. The performance of bridges is critical to the overall performance of the highway transportation system in the United States. However, many critical aspects of bridge performance are not well understood. The reasons for this include the extreme diversity of the bridge infrastructure, the widely varying conditions under which bridges serve, and the lack of reliable data needed to understand performance. The Long-Term Bridge Performance (LTBP) Program was created to identify, collect, and analyze research-quality data on the most critical aspects of bridge performance. This report describes the bridge infrastructure in the United States and explains why reliable indicators of bridge performance are necessary. Current methods of measuring performance are described, and the need for more precisely targeted performance indicators is discussed. The report explains bridge performance in terms of the aspects that have the most impact on the ability of the bridge to serve its intended purpose in a safe, efficient, and economical manner. The purpose of this report is to provide an understanding of what bridge performance means and the factors that influence bridge performance. It describes the various ways in which bridge owners measure and report bridge performance. It also describes how the LTBP Program will create new measures to allow deeper analysis and understanding, which will lead to ways to improve long-term bridge performance. THE MEANING OF "BRIDGE PERFORMANCE"
Figure 8. Equation. South Africa’s BCI. Figure 13. Equation. Margin of Safety. Figure 17. Equation. Reliability Index. Figure 46. Equation. Damage Tolerance. The United States is more dependent than ever on its transportation system to consistently support a thriving economy and to afford its citizens a satisfactory quality of life. The system must provide for rapid response in case of personal or public emergencies; ensure a high level of national security, safety, and resilience; and provide the ability to respond quickly in times of attack or natural disaster. However, the engineered components of the transportation infrastructure, including bridges, have aged. Some are deteriorated, and many have exhausted their capacity to meet the ever-expanding operational demands in urban areas and along major freight routes. The system has also become more interdependent on other transportation modes and on financial, telecommunication, and cyber infrastructures for its operational and structural safety and security. The transportation user community expects and deserves a system that routinely provides the highest quality service in terms of safety, efficiency, and economy while having the least possible impact on the local and global environment. Optimal operation of public highway systems is dependent on many factors. Bridges are critical nodes in the highway infrastructure, and poor performance of any bridge has the potential to reduce the operating capacity of the highway system it is a part of. Under current circumstances, most bridges will eventually reach a state where work is necessary to return the bridge or some of its components to a satisfactory level of condition or safety. The true criticality of bridges is often only apparent when work is necessary to maintain, rehabilitate, or replace an existing bridge or series of bridges; a bridge is closed due to conditions or service below acceptable levels; or a bridge collapses with attendant damage to property, disruption to service, or loss of life. Work zones where bridge work is underway usually involve one or more conditions that result in disruption to safe, efficient, and economical traffic flow. These conditions include narrowed or closed lanes, live load restrictions, speed reductions, inefficient detours, and safety hazards that result from these conditions. Negative impacts on local and regional economies and environments can often result from loss of productive time due to traffic delays and detours, work-zone accidents, or increased consumption of fuel and engine emissions, among other issues. In the United States, the current knowledge base of inventory and condition data on bridges is among the best in the world. Current programs and methods of bridge inspection and the tools used for managing bridge programs are also among the best in the world. Yet the level of understanding of how bridges perform and how to satisfactorily measure their performance falls well short of desirable. Many attempts at performance assessment rely on expert opinion combined with significant assumptions and generalizations. This bridge performance primer is intended to provide a clear and comprehensive perspective on the concept of bridge performance and to present a path to a better and deeper understanding of bridge performance, including how it can be reliably measured and used to improve the highway transportation system. This report describes the various ways in which bridge owners can and do currently measure and report bridge performance. It also describes how the Long-Term Bridge Performance (LTBP) Program will create new measures of performance that will allow a deeper analysis and understanding of performance, which will lead to ways to improve long-term bridge performance. The highway bridge infrastructure in the United States is very large and diverse. In this report, the term bridge is defined by the National Bridge Inspection Standards (NBIS): “a structure including supports erected over a depression or obstruction such as water, highway, or railway and having a track or passageway for carrying traffic or other moving loads and having an opening measured along the center of the roadway of more than 20 ft.”(1) A brief look at data from the National Bridge Inventory (NBI) provides a revealing picture of this vital public asset. The age of a bridge serves as a rudimentary measure of the aggregate service provided during its service life as well as a harbinger of the level of degradation and damage the bridge may have experienced without consideration of periodic interventions for preservation, maintenance, repair, or major reconstruction. Age data can also be meaningful in terms of understanding the bridge materials, design standards and specifications, and construction processes used in construction of a bridge. The overall performance of bridges of a certain age might be expected to be poorer than that of bridges built after more recent advancements. Advancements generally correlate with better current and future performance, though this is never a certainty. Service conditions for bridges vary dramatically in terms of traffic volume; truck loading (including overweight permit loads); level of vulnerability to natural events such as floods, ice, impact of waterborne debris, wind, and seismic loading; and susceptibility to long-term effects of climate and the service environment. Often, there is also the potential for significant damage from manmade hazards such as impacts by waterborne vessels or vehicular traffic, fires, explosions, chemical spills, or other events not considered ordinary service factors. In regions where snow and ice control is necessary, routine winter deicing operations result in application of chemicals that are known agents of deterioration of bridge elements. Other critical factors affecting bridge performance are the types, frequency, and effectiveness of preservation, maintenance, repair, or rehabilitation actions performed on bridges by the owner. In a few States, the transportation department owns and is responsible for maintenance of all bridges on public roads. However, in most States, a significant percentage of the bridges on public highways are owned by other types of agencies, including agencies at the county and city levels of government, railroad companies, toll authorities, and other semiprivate or private entities. Table 2 shows the numbers of different types of entities that have maintenance responsibilities for bridges on public highways. Bridge performance is impacted significantly by the policies and procedures at any bridge-owning agency as well as by the agency’s culture, the knowledge and experience of bridge personnel, the priorities of the agency, the revenues available for bridge programs, and the agency’s funding mechanisms. The cumulative effect of these factors may vary. At the level of State transportation departments, performance is generally good to very good, whereas at the level of local agencies, where resources are limited, performance may be fair to poor. 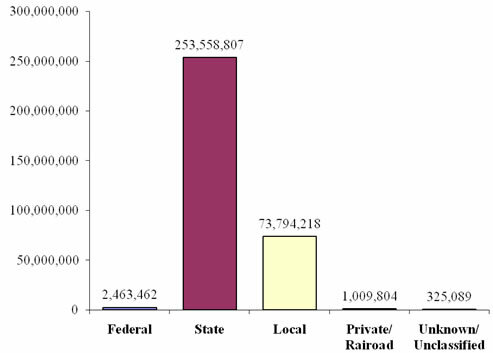 More detailed information on the demographics of the bridge infrastructure in the United States, as recorded in the 2011 NBI, can be found in the appendix. The Federal Highway Administration (FHWA) has initiated the LTBP Program, which was authorized in the Safe, Accountable, Flexible, and Efficient Transportation Equity Act: A Legacy for Users, signed into law in August 2005. The LTBP Program is a minimum 20-year, multifaceted research effort that is strategic in nature and has both specific short-term and long-range goals. Its concept is similar to the Long-Term Pavement Performance program that has been underway for more than 20 years. The overall objective of the LTBP Program is to inspect, evaluate, and periodically monitor representative samples of bridges nationwide in order to collect, document, maintain, and manage high-quality, quantitative performance data over an extended period of time. The program will employ sensing technologies and non-destructive evaluation and testing tools in addition to typical bridge inspection approaches. It will also require close collaboration among stakeholders, including public agencies, academia, and industry. Data collected under the LTBP Program will help in the performance evaluation of certain critical elements or features of bridges such as decks. Tools such as the Bridge Portal, data-driven deterioration models, life-cycle cost models, and a bridge condition index (BCI) will be developed to help engineers analyze the long-term performance of individual bridges. One simple definition of performance is that performance equates to accomplishment of a specified purpose or set of purposes. For the purposes of the LTBP Program, the following definition is used: Bridge performance encompasses how bridges function and behave under the complex and interrelated factors they are subjected to day in and day out – traffic volumes, loads, deicing chemicals, freeze-thaw cycles, rains, or high winds. Bridge design, construction, materials, age, and maintenance history also play roles in performance. Performance is usually associated with some set of standards, whether absolute or relative, and performance can be measured against those standards. In baseball, for example, one purpose of a batter is to hit safely, and a measure of the batter’s performance is the batting average – the number of hits divided by the number of at-bats. A batter hitting over 0.300 is considered to be performing very well. The purpose of a bridge is inherent in the NBIS definition: to carry vehicular traffic or other moving loads over a depression or obstruction such as water, highway, or railroad. Present a minimal safety hazard to users during normal service. Present minimal obstruction to the free flow of traffic at all times. Have a minimal negative impact on the local and global environments. Present an acceptable level of risk against catastrophic failure. Present an aesthetically pleasing appearance. Accomplish all of the preceding elements with minimal life-cycle costs. As a performance indicator for a baseball batter, batting average is a simple index with a range of 0.000-1.000. The batting average is a useful measure, but it does not reflect the value of the batter to the baseball team in a complete manner. Other related factors are also important, including hits with runners in scoring position; number of bases reached via singles, doubles, triples, and home runs; percentage of times reaching base safely; or even the outcome of at-bats in which the batter does not hit safely. In the same manner, the overall performance of a bridge cannot be described by any one rating, index value, or other individual parameter. The differences in batters’ levels of performance are analogous to the differences in bridges’ levels of performance. Imagine bridge A is located in an arid (dry, no-freeze) climate and bridge B is located in a northern (wet, freeze) climate. The bridges are steel multigirder simple span bridges that were built in the same year. The girders on bridge A are rated 8 on the NBI scale, nearly new condition. The girders on bridge B are rated 4, for poor condition with advanced section loss and deterioration. In comparing the relative performance of each bridge, factors such as annual snowfall, amount of deicing salts applied, and condition of the joints must be considered. Also of importance are the type and frequency of preservation treatments applied to the bridge (e.g., sealing joints, washing the superstructure, etc.). Continuing the analogy, baseball factors such as hits with runners in scoring position could be the equivalent of traffic and heavy trucks carried on the bridges. There are many different ways to measure bridge performance. Some of these measures are in the form of an index value calculated from a defined formula using input data such as NBI condition ratings and traffic volumes. As detailed later in this report, numerical indices such as the Federal Sufficiency Rating (SR), California Bridge Health Index, and Finnish National Road Administration (Finnra) Repair Index have been used for quite some time to define bridge performance. (2,4,5) For example, SR is an index calculated from an established formula and has a range of 100 (representing an entirely sufficient bridge) to 0 (representing an entirely insufficient or deficient bridge). An SR value of less than 50 indicates a low level of performance but does not reveal the specific characteristics of the bridge that render it deficient. Other measures are based on whether or not a bridge meets some defined criteria. These include classification as Structurally Deficient (SD) or Functionally Obsolete (FO) and whether a bridge meets or exceeds defined deflection limits. Still other measures reflect a level of operational capacity or service, including posted load, load rating, rideability of the bridge wearing surface, traffic congestion near or on the bridge, number of accidents on the bridge, and percentage of rain events and floods that overtop the bridge. Most of these measures can be applied to an individual bridge or to a population of bridges, such as bridges on the NHS or bridges of a certain type and material. Chapter 2 and chapter 3 provide insight into some of these measures, including measures for special considerations related to bridge safety and stability. Each measure has value depending on the person using the measures and the purpose for using it. For example, commercial interests, shippers, and drivers can use simple measures of posted weight limits or geometrical dimension limitations to weigh performance in terms of durability, operational capacity, and roadway safety, all important factors in supporting a free flow of goods and services. In contrast, chapter 4 shows that these measures do not readily support a better understanding of bridge performance because it is difficult to correlate changes in these measures with underlying causes of changes in performance. Chapter 4 discusses what needs to be done to better understand and develop solutions to improve bridge performance. The original design parameters and specifications such as bridge type, materials of construction, geometry, and load capacity. The initial quality of materials and of the as-built construction. The varying environmental conditions of climate, air quality, and surrounding soil. The extent and severity of corrosion or other deterioration processes that affect component strength or structural behavior (e.g., bearings locked up due to corrosion products). The traffic volumes and frequency and the weight of truck traffic carried by the structure. The type, timing, and effectiveness of preventive maintenance, minor and major rehabilitation actions, and ultimately, replacement actions. All of these factors combine to affect the condition and operational capacities of the bridge and its structural elements at any given point in the life of the bridge. While simple measures such as those described in this chapter are currently used to evaluate overall performance, a better performance measure would be an indicator of the qualitative or quantitative impact of a parameter or set of parameters on some specific aspect of bridge performance. Because bridge performance is a complex issue, it is useful to organize the primary issues relating to bridge performance into general categories. As shown in figure 2, the primary issues in bridge performance can be divided into four general categories: structural condition (for durability and serviceability), functionality (safety and traffic capacity), structural integrity and risk (for safety and stability), and costs to the user and to the agency. Figure 2 . Illustration. Main Categories of Bridge Performance Issues. Many relevant factors combine to affect performance under each of these four main categories. Table 3 lists the relevant factors that might impact various aspects of bridge performance. Within these categories are many specific performance issues that are of importance to the bridge community and that could be studied over the long term to achieve better understanding. For each of these specific performance issues, there are multiple data items that could be gathered to assist in the evaluation of performance. Table 3. 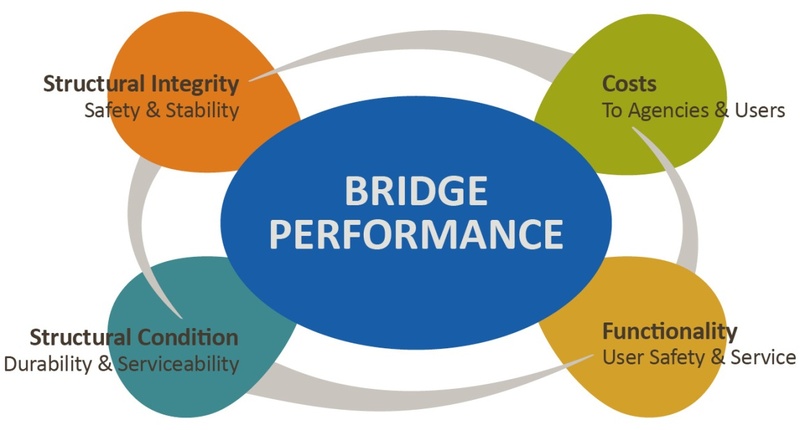 Main Categories of Bridge Performance and General Contributing Factors. Deliverers of goods and services. Legislators who create programs and provide funds for the design, construction, inspection, maintenance, repair, and replacement of bridges. Policymakers and administrators in transportation agencies. Engineers and planners who design and build highways and bridges. Bridge maintenance and bridge management engineers and personnel who work to keep bridges at a satisfactory level of service and prevent failures. Consultants and commercial interests who provide materials and services for the design, construction, inspection, management, maintenance, repair, demolition, and replacement of bridges. Providers of news who inform the public of issues of local and national interest related to highways and bridges. Bridge performance measures may have multiple uses depending on the perspective and responsibilities of those using the measures. The average everyday user seeks congestion-free travel, reassurance about highway safety, and rapid assistance from first responders. Less apparent but also of great importance to the everyday user is minimization of the use of public resources to keep bridges safe and at a satisfactory level of service. Engineers and planners should factor performance into future planning, design, and construction of bridges by applying lessons learned from the performance of previously built bridges. Bridge maintenance and bridge management personnel use measures of performance to evaluate the policies, practices, techniques, and materials that they employ to prolong bridge service at a satisfactory level and to project future bridge needs. Consultants and commercial entities use performance indicators to make critical business decisions on what technology, equipment, materials, and services to develop or improve and to provide to bridge owners. News outlets use simple performance measures and statistics to inform the general public and key transportation constituencies about critical issues related to the transportation system. Accurately evaluate congestion and traffic safety. Provide an accurate measure of load capacity, safety, and the need for load restrictions. Improved knowledge of how and why bridges deteriorate (i.e., advances in deterioration and predictive models). Better understanding of the effectiveness of various maintenance, repair, and rehabilitation strategies as well as management practices. Better understanding of the effectiveness of durability strategies for new bridge construction, including material selection. Improvements in bridge management practice using high-quality quantitative data. Set priorities for resource allocations within the transportation system and the bridge infrastructure. Evaluate organization-wide policies and programs such as the split between maintenance and capital funds. Improve system reliability, redundancy, and accountability. Establish risk-based evaluations of bridges that are vulnerable to failure. The large scale and extreme diversity of the bridge infrastructure. The many and variable causative factors that impact performance. A limited understanding of some of the key cause-and-effect relationships in bridge deterioration or diminished functional capacity. Data that are inconsistent, not in a usable format, not easily accessible, or unavailable. Different policies and practices for design, construction, inspection, preservation, maintenance, repair, and replacement for different samples of bridges. Changes in design codes, construction practices, and traditional bridge materials over time. The introduction of new and innovative materials. The widely differing objectives of various groups who assess bridge performance. Bolting and welding replaced riveting. Epoxy-coated reinforcing bars replaced black bars in many States. New alloys were developed to provide further corrosion protection for reinforcing bars. Design of concrete mixtures evolved, with significant improvements in strength and permeability characteristics. High-performance steels with greater strength, ductility, and corrosion resistance have become routinely used. High-performance concretes and steel have led to the possibility of lighter superstructure dead loads. Applications of non-traditional materials such as fiber-reinforced polymer composites have been developed both for new bridges and for repair or enhancement of in-service bridges. Repair materials and methods have changed and developed. Joint details have changed, including the use of integral abutment bridges. Reductions in injuries, fatalities, and property damage. Improvements in mobility of people and goods. Increases in the percent of pavements and bridges in satisfactory or better condition. Increases in the percent of bridges that are not posted with a weight limit restricting use by legally loaded vehicles. Improved customer satisfaction with maintenance, ride quality, and incidents of congestion. Many of these performance measures are dependent on the condition and functional operation of the owner’s bridges. But evaluating the impact of bridges on the achievement of most of these objectives is difficult at best, requiring intuitive reasoning and significant assumptions about cause and effect. 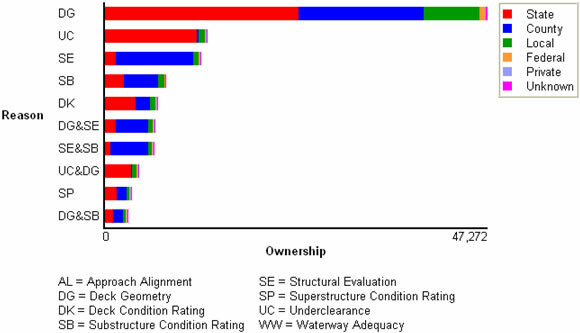 The percentage of bridge structures on the State highway system having a condition rating of either excellent or good. The percentage of bridge structures on the State highway system with posted weight restrictions. The percentage of bridge structures on the State highway system with an SR over 80. For almost four decades, as required by NBIS, bridge owners in the United States have compiled a complete inventory of bridge information and condition data, and many State transportation departments have several years of experience compiling comprehensive bridge databases for use in their bridge management systems. Despite these multiyear efforts, the availability of high-quality, useful data on many of the factors impacting bridge performance varies significantly from State to State. Much of the fixed data (e.g., structure type, construction materials, dimensions, clearances, scour protection, functional classification) are well documented and easily accessible. Current and historical data on the physical condition of bridge elements are also readily accessible; however, these data have shortcomings that are discussed later in this report. Beyond these two types of data, the availability and accessibility of high-quality, useful data on factors impacting bridge performance are generally poor to fair. In the United States, most of the effort in bridge performance assessment has concentrated on measuring, recording, analyzing, and using bridge condition data. Collection of detailed information and condition data about bridges in the United States started with implementation of NBIS in 1971 and has continued in a consistent, systematic, and computerized format for four decades. While these data have been and still are used to assess bridge performance, the NBI does not represent a complete basis for documenting and assessing long-term bridge performance with proper consideration of all relevant factors. A proper assessment of bridge performance over time requires systematic correlation of changes in bridge conditions and functional capacities with key policies, programs, and actions that affect those conditions and capacities. The collapse of the Silver Bridge at Point Pleasant, WV, in December 1967 was the defining moment in the development of bridge inspection programs, bridge data collection, formal bridge improvement programs, and, ultimately, modern bridge management systems. Prior to this event, knowledge of bridges was poor. Immediately after the collapse, crucial questions about the bridge population arose: How many bridges are there in the United States? What types of structures? Of what materials were they constructed? Where are they located? What are their current conditions? How vulnerable are they to failure? What are the immediate improvement priorities? What is the required scale of effort and associated cost to address significant deficiencies? There were virtually no useful answers immediately available. As a consequence, there was no basis for assessing the condition of individual bridges or the overall bridge population. There was certainly no basis for assessing the performance of bridges over time. Identification (location, features carried, and features crossed). Age and time in service. Appraisal ratings (current ratings of adequacy of major features such as deck width and approach roadway alignment). Proposed improvements and inspection requirements. 8, Very good condition: No problems noted. 7, Good condition: Some minor problems. 6, Satisfactory condition: Structural elements show some minor deterioration. 5, Fair condition: All primary structural elements are sound but may have minor section loss, cracking, spalling, or scour. 4, Poor condition: Advanced section loss, deterioration, spalling, or scour. 3, Serious condition: Loss of section, deterioration, spalling, or scour have seriously affected primary structural components. Local failures are possible. Fatigue cracks in steel or shear cracks in concrete may be present. 2, Critical condition: Advanced deterioration of primary structural elements. Fatigue cracks in steel or shear cracks in concrete may be present or scour may have removed substructure support. Unless closely monitored, it may be necessary to close the bridge until corrective action is taken. 1, Imminent failure condition: Major deterioration or section loss present in critical structural components or obvious vertical or horizontal movement affecting structure stability. Bridge is closed to traffic but corrective action may put back in light service. 0, Failed condition: Out of service – beyond corrective action. 9: Superior to present desirable criteria. 8: Equal to present desirable criteria. 7: Better than present minimum criteria. 6: Equal to present minimum criteria. 5: Somewhat better than minimum adequacy to tolerate being left in place as is. 4: Meets minimum tolerable limits to be left in place as is. 3: Basically intolerable requiring high priority of corrective action. 2: Basically intolerable requiring high priority of replacement. 1: This value of rating code is not used. While these performance measures have served well when used for condition evaluation and apportionment of funds, these measures do not cover all of the variables that researchers would like to evaluate. The NBI condition ratings are well established after almost four decades of use in assessing the current condition of the major components of bridges being inventoried and inspected. The same is true of NBI appraisal ratings for assessing functional capacities. Changes in these ratings over time reflect the general performance of the bridge. The ratings are used to classify bridges as deficient or not deficient. SD: A highway bridge is classified as structurally deficient if item 58 (deck), item 59 (superstructure), item 60 (substructure), or item 62 (culvert) is rated “poor” condition or worse (coded 4 or lower on the NBI rating scale). A bridge can also be classified as SD if its load-carrying capacity is significantly below current design standards, with item 67 (structural evaluation appraisal) coded 2 or lower, or if item 71 (waterway adequacy) for the feature below the bridge is coded 2 or lower. FO: A highway bridge classified as functionally obsolete is not SD, but its design is outdated. The bridge may have lower load-carrying capacity, narrower shoulders, or less clearance underneath than bridges built to the current standards. Classification as FO is triggered by a code of 3 or lower for item 68 (deck geometry appraisal), item 69 (underclearances, vertical and horizontal), or item 72 (approach roadway appraisal). A bridge is also classified as FO if item 67 (structural evaluation appraisal) or item 71 (waterway adequacy appraisal) is coded 3. The two classifications of deficient bridges provide simple tools for agencies to describe the overall performance of their bridge populations and the overall effectiveness of their bridge programs. An unpublished 1999 FHWA study described various ways in which State transportation departments use these two classifications in their measurement of bridge performance. Several agencies use only the number of deficient bridges as a measure, whereas others use a combination of SR and the number of deficient bridges. When determining the proportion of a bridge population flagged as deficient, some agencies take into consideration the relative size of deficient bridges, represented by the cumulative square footage of deck the structures carry, rather than a simple count of structures. This approach is intended to discourage the practice of repairing small structures to improve the metrics while deferring repairs on larger structures that carry significant traffic for which repair would incur greater expense. Oftentimes, agencies will consider both metrics in their assessment of program performance. SR is an index that was devised by FHWA and used to evaluate the eligibility of bridges for Federal highway bridge rehabilitation and replacement funds. The SR formula is a method of evaluating highway bridge data by calculating and summing four separate factors to obtain a numeric value indicative of bridge sufficiency to remain in service. On the resulting rating scale, 100 represents an entirely sufficient bridge and 0 represents an entirely insufficient or deficient bridge. SR is calculated using a complex formula wherein weighting factors are assigned to several bridge parameters and attributes in order to arrive at the numerical index for each bridge. The basic formula is shown in figure 3. S1 = Structural adequacy and safety (maximum value = 55 percent). S2 = Serviceability and functional obsolescence (maximum value = 30 percent). S3 = Essentiality for public use (maximum value = 15 percent). S4 = Special reductions (maximum value = 6 percent). Structural adequacy and safety: Condition ratings for deck, superstructure, and substructure plus the inventory (load) rating. Serviceability and functional obsolescence: Traffic lanes, average daily traffic (ADT), structure type, structural evaluation, waterway adequacy, and Strategic Highway Network (STRAHNET) designation plus several key geometric parameters. Essentiality for public use: Detour length, ADT, and STRAHNET designation. Special reductions: Detour length, traffic safety features, and structure type. To further its goal of preserving the bridge inventory, the California Department of Transportation has adopted a bridge health index as a performance measure. The health index is a single number indicator of the structural health of the bridge. This indicator is expressed as a value from 0 to 100 percent, corresponding to the worst and best possible conditions, respectively. The health index is calculated as a function of the fractional distribution of the bridge’s element-level information across the range of applicable condition states, as shown in figure 4. QCSi = Quantity in condition state i.
WFi = Weighting factor for condition i.
TEQ = Total element value i. Other State transportation departments also use health indices. The California Department of Transportation’s index is cited here as an example. In the interest of understanding what other nations use to evaluate their bridge inventories, FHWA sponsored an international scan that resulted in the report Bridge Preservation in Europe and South Africa. (5) The following discussion of performance measures used in Finland, South Africa, and Sweden includes excerpts from that report. The repair index is a weighted combination of condition ratings that establishes priorities for repair projects and depends primarily on defect severity and ADT. The rehabilitation index responds to functional deficiencies and can indicate a need for improvement rather than repair. Finnra computes performance measures for defects, repair needs, and rehabilitation needs. A repair index is computed for the set of defects at a bridge. A rehabilitation index is computed for functional deficiencies. A repair index contributes to priorities for repair, unless the rehabilitation index indicates that a repair project should be set aside in favor of a rehabilitation project. Wt = Weight (importance) of the damaged structural part. C = Condition of the structural part. U = Urgency of the repair. D = Class (severity) of damage. k = A weighting factor for damage summation. The default value is 0.2. The importance of the various structural parts is weighted from 0.20 for expansion joints to 1.00 for the superstructure. Condition points are assigned on a sliding scale as shown in table 4. Urgency of the necessary repair is classified with a point system of 10 points for repairs needed during the next 2 years, 5 points for repairs needed during the next 4 years, and 1 point for repairs not needed within 4 years. The severity of the deterioration or damage is also classified using a point system with 1 point for mild severity, 2 points for moderate severity, 4 points for serious severity, and 7 points for very serious severity. Finally, a weighting factor based on ADT is assigned for the essentiality of the repair, as shown in table 5. Finnra’s rehabilitation index, UTI, is calculated as shown in figure 6.
kp = Factor for bridge total area. kl = Factor for ADT. The authors of the FHWA report also note, “The rehabilitation and reconstruction index, UTI, combines deterioration, bridge load capacity, and functionality to determine whether a bridge should be rehabilitated or replaced rather than repaired.”(5) Finland sets annual goals for reducing severe deterioration in structures. In South Africa, performance measures are expressed as a condition index, Ic, for each defect and in terms of BCI for each bridge. The BCI combines the individual defect indices to provide an overall measure for the bridge. Figure 7 shows the formula used to calculate Ic. D = Degree of defect. E = Extent of defect. R = Relevancy of defect. D, E, and R are each assigned on a scale of 0 – 4, with 0 indicating no defect or that the defect is of no significance to the structural condition and 4 indicating the worst case in terms of severity, extent, or impact.The authors of the FHWA report note: “Ic equals 100 when there is no defect, and equals 0 when D and E and R are all equal to 4. A defect is critical if the Ic is below 40.”(5) Figure 8 shows the formula for BCI. BCIn = BCI for structure n.
Ic = Sum of condition index values for all relevant defects in structure n.
ADTn = ADT for structure n.
ADTi = Sum of values of ADT for all structures in the prioritization process. BCI gives a combined indicator of the importance of defects and the importance of the bridge. A high BCI value indicates a good bridge, and a low value indicates a poor bridge. The further scaling by traffic volume will tend to increase BCI for heavily traveled bridges. The BCI for each bridge is computed, and a linear model is used for the decrease of the BCI with time. Priorities for repairs are developed from two considerations. First is structural adequacy, as indicated by BCI values. Second is functional importance, an evaluation computed from road class, bridge load capacity, detour length, etc. Generally, network-level optimization seeks the set of projects that offers the greatest reduction in defect relevancy, R, for a given budget. Priorities for repairs in South Africa are determined by BCI and ADT. “Deterioration models consider structures in groupings determined by age and structural type. Deterioration is forecast as a continuing loss in capital value. The general form is [given by figure 9]. LCV = Lack of capital value. ao, a1 , r = parameters of the model. Condition of critical bridge components. Criticality of the components in the bridge structural system. Essentiality of the bridge to the highway network it serves. Essentiality of the bridge is often represented by volume of traffic carried or type of traffic carried (e.g., emergency responders, school vehicles, commercial traffic, military traffic, etc.). When the performance measure is calculated for a group of bridges, the distribution of the performance measure values describes the performance of the group as a whole. These measures can be used to establish the order of priority for corrective or improvement actions or programs. Also, the bridge owner or agency can look at trends in bridge performance measures (rising or falling over time) and evaluate the effectiveness of bridge programs or the need to commit more resources to those programs. These formulae are very useful for their intended purposes. Highway bridges are normally expected to provide acceptable service for extended periods of time. Thus, most existing highway bridges have to be maintained in service for extended periods of time in spite of deterioration due to aggressive environmental stressors, aging of materials, and traffic increases. The safety and capacity of these bridges are highly influenced by their deterioration. In order to avoid the consequences of loss of serviceability or failure, maintenance programs are carried out by the responsible authorities. To make these programs cost-efficient, bridge life-cycle performance must be accurately predicted. (6-8) However, difficulties arise in the prediction of life-cycle performance because of the complexity and high uncertainty of deterioration mechanisms such as cracking, corrosion, and fatigue. Consequently, proper performance indicators are essential to evaluating bridge performance in a quantitative manner. Many studies have focused on quantifying bridge performance by using deterministic, semi-probabilistic, and probabilistic indicators such as safety factors, partial safety factors, and the reliability index. Modern bridge design codes take uncertainty into account by including specific factors (i.e., load and resistance factors) in the computation of structural resistance and load effects with Load and Resistance Factor Design (LRFD) methods. However, prediction of bridge performance with deterioration requires the simultaneous use of several performance indicators. For example, the reliability index may be an adequate measure for quantifying the safety of a bridge component or system for ultimate capacity, but the redundancy index is required to evaluate the availability of warning before collapse. Moreover, for bridges with deterioration and local damage, it is essential to consider performance indicators related to damage tolerance, such as reserve strength factor, residual strength factor, and vulnerability, together with the indicators for ultimate capacity. To obtain a desired bridge safety level, the values of performance indicators under consideration should not drop below prescribed minimum threshold levels. The life-cycle cost of bridges is another measure that decisionmakers have to balance with appropriate safety indicators. In recent years, life-cycle performance, safety, reliability, and risk of civil infrastructure systems have become emergent and key issues due to recurring natural and manmade disasters, the infrastructure crisis, sustainability issues, and global warming. Uncertainties are unavoidable in dealing with these problems. (See references 6 and 9-11.) Management of aging civil infrastructure involves significant expenditures. At a time of constrained public resources, difficult decisions are required to establish priorities for maintenance, rehabilitation, and replacement. Decisions regarding requirements for design, continued service, rehabilitation, or replacement should be based on multicriteria optimization under uncertainty, in order to balance conflicting requirements such as cost and performance. This can only be achieved through proper integrated risk management planning in a comprehensive life-cycle framework. Such a framework is shown in figure 10. The purpose of this study is to review several performance indicators used to evaluate bridge performance. These indicators are briefly presented. In addition, a classification of bridge performance indicators is made depending on the approach (deterministic, semi-probabilistic (LRFD), or probabilistic) and level of concern (cross-section, component, or system level). Condition ratings, CR, are used in the NBI to describe the existing, in-place bridge as compared to the as-built condition. Evaluation is for the materials, physical condition of the deck, superstructure, and substructure components of a bridge. Condition rating codes are properly used when they provide an overall characterization of the general condition of the entire component being rated. The load-carrying capacity is used in evaluating condition items. The fact that a bridge was designed for less than current legal loads and may be posted has no influence on condition ratings. The general condition ratings shown in chapter 2 are used as a guide in evaluating deck, superstructure, and substructure. The range of values possible for CR is shown in figure 11. Based on visual inspection, AASHTOWare Bridge Managementâ„¢, the bridge management system of the American Association of State Highway and Transportation Officials (AASHTO), assigns condition states, CS, for bridge components. The condition states vary between 1 and 5, with each increasing condition state indicating a higher damage level. The range of values possible for CS is shown in figure 12. The margin of safety, M, represents how much of the bridge cross-section, component, or overall bridge system capacity is held in reserve at a point in time. It can be expressed as shown in figure 13. R = Random variable representing the resistance effect. Q = Random variable representing the load effect. The time-dependent margin of safety, M(t), is shown in figure 14. R = Time-dependent variable representing the resistance effect. Q = Time-dependent variable representing the load effects. Making the assumption that R and Q are statistically independent random variables, the instantaneous probability of failure, Pf, is shown in figure 15. R = Random resistance in a certain failure mode. Q = Random load effect in the same failure mode. FR(x) = Cumulative distribution function of R.
fQ(x) = Probability density function of load effect Q. In many cases, it is impossible to evaluate Pf by analytical methods. Therefore, numerical methods such as the first-order reliability method, second-order reliability method, and Monte Carlo simulation are used. Failure and survival are complementary events. Therefore, the probability of survival, Ps, (also called reliability) is defined as shown in figure 16. The reliability of a bridge can be expressed in terms of either Pf or its corresponding reliability index, β. For normal (Gaussian) distributed independent variables, β can be calculated as shown in figure 17. E(R) = Mean value of the resistance effect. E(Q) = Mean value of the load effect. σ(R) = Standard deviation of the resistance effect. σ(Q) = Standard deviation of the load effect. For normally distributed independent variables, Pf and β are related as shown in figure 18. Φ ( ) = Standard normal distribution function. One of the most important measures in the evaluation of bridge performance is life-cycle cost. The proper allocation of resources can be achieved by minimizing the total expected cost while keeping structural safety at a desired level. The expected life-cycle cost can be expressed as shown in figure 19. CET = Expected life-cycle cost. CT = Initial design/construction cost. CPM = Expected cost of routine maintenance. CINS = Expected cost of performing inspections. CREP = Expected cost of repairs. CF = Expected cost of failure. CF is the cost of removal and replacement of an individual member or the cost of demolition of the existing bridge and replacement, if necessary, with a new bridge. Within this framework, all future costs are converted to their net present value. In the case of structural health monitoring (SHM), the expected life-cycle cost is as shown in figure 20, with figure 21 defining the expected cost of monitoring, CMON. MT = Expected initial design/construction cost of the monitoring system. MOP = Expected operational cost of the monitoring system. MINS = Expected inspection cost of the monitoring system. MREP = Expected repair cost of the monitoring system. Using this approach, the benefit of the monitoring system, BMON, can be determined through a comparison of the expected life-cycle total cost with and without monitoring, as shown in figure 22. Using figure 22, monitoring is economically beneficial if BMON > 0. A monitoring benefit may be realized through better treatment of maintenance and repair activities as well as a lower level of risk over the life of the structure. Bridge managers can prevent or reduce adverse consequences by using monitoring data. Allowable Stress Design (ASD) is based on the concept that the maximum stress in a component should not exceed a certain allowable stress under normal service conditions. The limiting stress, which can be yield stress or stress at instability or fracture, is divided by a safety factor to provide the allowable stress. The safety factor, SF, is used to provide a design margin over the theoretical design capacity and is defined as shown in figure 23.
σ u = Maximum usable stress, which can be the yield stress, buckling stress, or ultimate stress. σ all = Allowable stress. In LRFD, resistance R and load Q are considered statistically independent random variables. If R is greater than Q, a margin of safety exists. On the other hand, since R and Q are random variables, there is a probability that R is smaller than Q. The typical inequality for safety checks in LRFD is shown in figure 24.
φ = Resistance factor associated with nominal resistance Rn. γD, γL = Partial load factors associated with the dead and live loads effects QDn and QLn. In LRFD, resistance Rn is reduced by resistance factor φ, and loads are amplified or reduced by load factors. In figure 25, ηi , is defined by figure 26 for loads for which a maximum value of γi is appropriate and by figure 27 for loads for which a minimum value of γi is appropriate. ηD = Factor relating to ductility. ηR = Factor relating to redundancy. ηi = Factor relating to operational importance. In the plastic analysis of structures, collapse load multiplier, λ, is a theoretical factor by which a set of loads acting on the structure must be multiplied just enough to cause the structure to collapse. The load can be taken as the service load conditions, and the strength of the structure can be determined from idealized plastic material strength properties. Three main loading histories are considered. Proportional loading implies that the applied load can be defined at all stages by a single parameter, λ , which amplifies the service load, Q = QD + QL, so that the ultimate load, QU, is as shown in figure 28. This extension of ASD practice is used in the plastic design of steel structures but is an unrealistic concept because dead loads are not subject to the same variations as live loads. Combined loading assumes that the dead load is fixed and the live load only is variable, as shown in figure 29. Arbitrary loading assumes that the dead and live loads vary independently in both magnitude and time. The dead load first reaches its full factored value, λ DQD, before the live load is applied from zero to its full value, λLQL, as shown in figure 30. The inequality RU ≥ QU has to be satisfied at the limit, where RU is the plastic resistance of the structure. The loads due to natural phenomena such as earthquakes, storms, and high winds have randomness not only in space but also in time. The randomness in time can be considered in terms of return period, . Return period is an average duration between consecutive occurrences of an event. It should be noted that the actual time between the occurrences is T, which is a random variable, and is only average duration. can be expressed as shown in figure 31.
p = Probability of occurrence of the event. q = Corresponding probability of nonoccurrence (therefore, q = 1 – p). The infinite series inside the parentheses yields 1/p2. Therefore, the average duration between consecutive occurrences of an event is as shown in figure 32. The probability of failure within a certain period of time is called the cumulative time probability of failure, F(t). There are two approaches for computing cumulative probability of failure. In the first approach, F(t) is computed considering only one random variable, the time Tf at which the component or system fails. Probability concepts are applied to compute F(t). In this approach, F(t) up to time tf can be calculated as shown in figure 33. F(tf) = Area under the probability density function f(u) of the time to failure from t0 to tf. In the second approach, F(t) is computed considering changes in both time-variant resistance and load. The cumulative time probability of failure of a component whose resistance is deteriorating subjected to time-variant load is shown in figure 34.
λ = Mean occurrence rate of stochastic load event in a Poisson process. Fs( ) = Cumulative time distribution function used to define the load intensity. fRo(r) = Probability density function of the initial resistance R0. g(t) = Mean value of G(t). G(t) = Resistance degradation function. Cumulative time probability of survival, S(t), also called survival function, is the probability that a component or system survives until time t. It is equal to the reliability function, which is the probability that a component or system is still functioning at time t. S(t) is the complement of the F(t) and can be expressed as shown in figure 35. S(t) = Area under the probability density function f(u) of the time to failure of tf to infinity. Reserve strength factor, R1, is defined as the ratio of the load-carrying capacity of the intact structure (or component), C, to the applied load on the structure (or component), Q, as shown in figure 36. R1 varies from a value of infinity, when the intact structure (or component) has no load, to a value of 1.0, when the nominal load on the intact structure (or component) equals its capacity. The residual strength factor, R2, provides a measure for the strength of the system in a damaged condition compared to the intact system. It is defined as the ratio of the capacity of the damaged structure (or component), Cd, to the capacity of the intact structure (or component), C, and can be expressed as shown in figure 37. R2 takes values between 0, when the damaged structure has zero capacity, and 1.0, when the damaged structure does not have any reduction in load-carrying capacity. Redundancy factor, R0, is defined as shown in figure 38. R0 varies between 1.0, when the damaged structure has zero capacity, and 0, when the damaged structure does not have any reduction in load-carrying capacity. Damage factor, D, is used to represent the loss in cross-sectional area of a bridge component. It is defined as shown in figure 39.
ad = Cross-sectional area of the damaged portion of the bridge component. a = Intact cross-sectional area of the bridge component. Redundancy, which is a measure of reserve capacity, can be defined as the availability of warning before structural collapse occurs. The failure of a single member will not cause failure of a redundant structure. There are several measures for probabilistic redundancy index, RI, including those shown in figure 40 through figure 42.
βintact = RI of the intact system. βdamaged = RI of the damaged system. Pf(dmg) = Probability of damage occurrence to the system. Pf(sys) = Probability of system failure. Py(sys)(t) = System probability of first yield at time t.
Pf(sys)(t) = Probability of system failure at time t.
βy(sys)(t), βf(sys)(t) = Reliability indices with respect to first yield and system failure at time t.
An increase in the value of RI indicates a higher system redundancy. A structural system is considered non-redundant if RI = 0. Vulnerability, V, is one of the key measures used to capture the essential feature of damage-tolerant structures. A probabilistic measure of V can be defined as the ratio of the failure probability of the damaged system to the failure probability of the undamaged system, as shown in figure 45.
rd = A particular damaged state. r0 = An undamaged system state. P(rd, Q) = Probability of failure of the system in the damaged state. P(r0, Q) = Probability of failure of the system in the pristine state. V refers to vulnerability of the system in state rd for prospective loading Q. The value of V is 1.0 if the probabilities of failure of the damaged and intact systems are the same. Damage tolerance, Dt, can be defined as the reciprocal of V, as shown in figure 46. Ductility, Δ , is generally defined as the ability of a bridge component or the entire bridge to sustain large deformations without collapse. A ductility index could be defined as shown in figure 47. Δ c = Deformation at collapse. Δ el = Deformation associated with the limit of elastic range. Robustness, RO, is one of the key measures in the field of progressive collapse and damage-tolerant structures. Although robustness is recognized as a desirable property in structures and systems, there is not a widely accepted theory on robust structures. (35) In general, RO is defined as insensitivity of the safety of a structure to local failure or the ability of a structure to prevent failure progression. Resilient structures respond well to extreme events. They reduce the probabilities of failure, the consequences of failure, and the time for recovery. Resilience, RE, can be measured by the functionality of an infrastructure system after a disaster and by the time it takes for a system to return to predisaster levels of performance. (36) Despite several RE measures proposed in the literature, a standard measure for bridge resilience has yet to be specified. Risk, , may be expressed as a function of the probability of occurrence of adverse event A, P(A), and the consequence of this event, K (typically expressed in monetary terms). Often, is defined as the product of P(A) and K, as shown in figure 48. The uncertainties in both P(A) and K will carry over in calculating . Minimizing risk is one of the main objectives of bridge management. This can be achieved by minimizing the probability of occurrence of the adverse event (e.g., probability of bridge collapse), minimizing the consequences associated with this event, or minimizing both. Low-probability, high-consequence events are of particular relevance in risk-informed decisionmaking and management of aging bridges. A classification of the defined structural performance indicators depending on the approach (deterministic, semi-probabilistic (LRFD), or probabilistic) and level of concern (cross section, component, or system level) is presented in table 6. More than one checkmark in the same category indicates that the performance measure can be classified in each section depending on the situation. Risk-informed assessment and management of the highway bridge infrastructure in the United States requires a set of reliability-based performance indicators and decision tools. Consideration of multiple performance indicators in the evaluation of structural performance is inevitable. The indicators that should be considered depend on the priorities and objectives of the decisionmakers. The main remaining challenge lies in the implementation of reliability-based performance indicators that account for the presence of both natural randomness (i.e., aleatory uncertainty representing the natural variability or randomness of nature) and imperfect knowledge (i.e., epistemic uncertainty representing our imperfect ability to model reality) in bridge engineering. The indicators for evaluating bridge performance are not limited to those mentioned in this study. Table 6. Classification of Structural Performance Indicators. √ Checkmark indicates performance indicator meets classification; blank cells indicate performance indicator does not meet classification. Bridges are a critical part of the transportation system. The bridge infrastructure is a vast and valuable asset that must be properly managed in the interests of efficiency, safety, economy, national security, and protection of local and global environments. The need for useful, reliable bridge performance measures is clear. Additionally, there is a need for methods to evaluate the impact of different scenarios of funding, maintenance practices and priorities, design methodologies, and new technologies on future bridge performance. The performance measures described in chapter 2 are consistently applied and well-tested in practice. However, they do not lend themselves to predictive efforts nor to analysis of various “What if ... ?” scenarios. The LTBP Program will concentrate on collecting information and data that will allow exploration of scenarios that have actually happened. This will lead to tools such as better deterioration models, allowing better predictions of bridge performance. The performance indices described in this report generally attempt to address the bridge as a whole entity and aggregate values among a population of bridges. However, bridges are composed of several unique elements that work as a system. Each of these elements responds to a different set of factors that govern its performance. Even when the same factor affects the performance of more than one element, the manner and degree to which that factor impacts each element may vary considerably. Many aspects of bridge performance are not well understood, and current indices of bridge performance are usually based on objectives that are imprecise and data that are not consistent or well documented. Many attempts at assessment of performance (of the complete structure or key elements) rely on expert opinion and significant assumptions and generalizations. Yet, decisions at many different levels and for many important purposes are based on these performance assessments. Establishing clear, objective measures that are relevant to different levels of decisionmaking. Identifying the elements and characteristics of a bridge that most seriously impact the bridge in the four performance categories: condition and durability, functionality, structural integrity and safety, and cost. This exercise should consider both short-term issues and the long-term potential for improved performance through innovative materials, enhanced inspection technology, improved design concepts, and evolving construction and maintenance methods. Identifying critically needed data for experimental studies that will improve the knowledge of the multivariable cause-and-effect relationships that govern performance degradation. Collecting data to fill gaps and create valid models that describe deterioration mechanisms, predict future deterioration, and support more realistic life-cycle cost calculations. Such information can then be used to further calculate operational efficiency and safety versus various levels of condition and capacity, as well as the probability of structural system failure at both the service and ultimate-limit states. Improving the relevance and quality of the data collected and used to support analyses and calculate performance indicators. Developing tools and systems for calculating and disseminating results about performance indicators. The NBI contains condition ratings for the major structural elements of the bridge — deck, superstructure, and substructure — plus channel, channel protection, and culverts. The NBI does not contain data on the condition of the myriad individual subelements of a bridge such as beams, pier columns, and abutments. The NBI contains appraisal ratings for a few key features of the bridge, most notably structural evaluation, deck geometry, and scour criticality. The NBI does not contain quantitative measurements of differing conditions or the locations of differing conditions with respect to the geometry of the element being inspected. In most cases, the condition ratings are assigned based solely on visual inspections. Underlying causes of damage, such as rebar corrosion, are not identified until surface damage appears. NBI ratings do not reflect incipient degradation. The full range of codes (from 9 for excellent condition to 0 for failed condition) consists of discrete integers corresponding to the guiding language. This type of data is not readily amenable to rigorous mathematical analysis with the purpose of charting continuous change or for predicting future changes. The most common bridge management system in the United States is the AASHTOWareTM Bridge Management software. The developers of this system incorporated a detailed condition assessment approach. An element-level inspection system was developed to track both the severity and the extent of different problems. AASHTOWareTM Bridge Management addresses deterioration as a probabilistic, rather than deterministic, process and is able to automatically update previous deterioration predictions as more cycles of historical inspection data are input. The initial probabilities of transition from one condition state to the next were determined from consensus of expert opinion. These can be modified by the licensing agency if desired. Under the element-level inspection system, condition data are recorded on the individual elements of the bridge rather than on the general elements of deck, superstructure, and substructure. This expands the data collected while allowing the use of specific guidance and employing precise engineering language for inspectors to rate the elements. Thus, the severity of any deterioration is defined, and the extent is estimated and recorded. While the element-level data system provides more granular information than the NBI condition ratings, it is still based mostly on visual inspection of surface conditions and relies on inspector training and experience for data quality. It does not, for the most part, document latent defects, such as initial corrosion of reinforcing bars that could soon change the observed condition at the surface level. Identifying trends in bridge performance. Identifying general parameters that govern performance. Identifying representative bridges and service conditions that can provide a real-life laboratory for studying performance issues. History of maintenance actions and timing. Financial records of maintenance costs. Beyond these current resources, the data needed to properly evaluate the important aspects of bridge performance can be quite extensive. Table 7 and table 8 show the breadth of data that may be necessary to better understand bridge performance in the four main categories. Table 7. Durability and Serviceability Performance Data. Table 8. Functionality, Cost, Structural Integrity, and Organizational Data. Isolate specific aspects of bridge performance that have the potential to significantly increase the costs associated with bridges (these costs may be in terms of dollars for bridge maintenance and rehabilitation; damage to the environment; property damage, injuries, or fatalities in bridge-related accidents; or delays associated with congestion at narrow bridges or bridges under repair). Establish working hypotheses as to the cause of poor performance. Identify the parameters that have the most impact on performance. Identify the critical data needed to prove or disprove the hypotheses. Identify the data collection methodologies that best balance effectiveness and data quality with the costs of data collection. The focus should be on obtaining the best available data rather than on trying to obtain perfect data. This process will support the ability to design, implement, and complete statistically sound experimental studies to prove or disprove the hypotheses. The result will be better understanding of bridge performance and the knowledge necessary to implement policies, programs, and specific actions that will result in improved performance. An example of how this process would work for the issue of performance of FO bridges is described in the following section. The objective of the study is to examine the performance of bridges classified as FO and evaluate the frequency and severity of negative impacts (e.g., accidents, vehicle-bridge collisions, and instances where the bridge route does not function adequately) as a result of alignment disparities. What Effect Does Inadequate Roadway Alignment Have on Road Safety and Traffic Flow? A moderate to severe misalignment of the approach roadway and the bridge roadway may cause momentary reductions in speed and erratic movements by drivers. These actions may contribute to accidents close to or on the bridge. They may also contribute to impaired traffic flow. Auto and truck traffic volumes. Traffic control features at and near the bridge. Posted speed and typical traffic speeds. Ambient conditions such as light and precipitation. The effort to analyze and better understand various aspects of bridge performance should not be confused with the need to continue collecting required NBI data and the element-level data now collected to support bridge management systems. No recommendations are being made to expand the volume or enhance the quality of the data currently collected for these purposes. Bridge performance measures should be able to provide a link between a specific parameter (or set of parameters) and the level of some desirable quality or characteristic of bridges or bridge elements. For example, a traffic safety measure should provide a link between accident experience and geometric characteristics such as bridge width. However, the performance of any single bridge element is dependent on complex interactions of multiple and often interrelated factors, including the original design parameters and specifications (bridge type, materials, geometries, and load capacities); the initial quality of materials and of the as-built construction; varying environmental conditions of climate and air quality; corrosion and other deterioration processes; traffic volumes and percentage of truck traffic; and the type, timing, and effectiveness of preventive maintenance, minor and major rehabilitation actions, and ultimately, replacement actions. Realistically, it is usually impossible to isolate one specific parameter as the governing parameter for a specific quality. Even in the simple example of accident history, several different factors are linked to safety, including bridge and roadway geometry, traffic volumes and vehicle types, travel speeds, weather conditions and winter maintenance operations, night visibility, and pavement and deck riding surface condition. Analysis of the 2011 NBI data shows that the primary cause for a bridge to be flagged as SD or FO is related to deck geometryâ€”a bridge is FO because the roadway width is considered too narrow for the traffic volumes currently using the bridge. (2) Figure 49 provides the top 10 reasons why a bridge is rated as deficient. Calculation of Federal SR for a given bridge, particularly the part of SR dependent on functional characteristics, is based on somewhat arbitrary definitions and significant assumptions. For bridges whose geometry does not meet currently accepted standards, many of the criteria used to calculate SR are not well documented and may not be well understood by bridge engineers. Traffic safety in the vicinity of bridges is an important parameter of bridge performance, yet there are no proven relationships that relate safety to bridge characteristics such as clear deck width, clearances, or approach roadway alignment. The Recording and Coding Guide for the Structure Inventory and Appraisal of the Nation’s Bridges presents a table for evaluating deck geometry that considers traffic volumes, lane widths, direction of traffic, and type of highway system. (1) No apparent research supports these numbers, and the method ignores possibly causative or complicating factors such as climatic conditions, percent of trucks in the traffic stream, approach roadway alignment, and posted speed. Therefore, a study to examine the cause-and-effect relationships between bridge and traffic parameters and accident history near and on bridges would be useful. The data in the NBI and other available databases can be mined to create a subset of bridges that reflects a range of the key variables, including traffic volumes, truck traffic, deck widths, and perhaps other causative factors such as climatic conditions, approach roadway alignment, and posted speed. The FHWA Bridge Management Information Systems Laboratory was established to identify and analyze causes and trends of deficiencies within the Nation’s bridge inventory. The laboratory has developed or acquired the tools to support sophisticated analytical research on existing disparate data sources through a geographical information system platform combined with relational database management systems software and advanced mathematical and statistical software. Under a program such as LTBP, data about type and frequency of accidents can be monitored, and analysis of long-term accident experience can be used to correlate accident potential with the most relevant bridge parameters. Ultimately, the findings could be used to better understand the bridge deficiencies that most affect functional characteristics of bridges. The preceding discussion is one example of an aspect of bridge performance that could be improved by a better understanding of cause-and-effect relationships supported by accurate, reliable data. This principle of establishing and proving cause-and-effect relationships using high-quality research data is one of the major goals of the LTBP Program. With more relevant and reliable data and improved understanding of key cause-and-effect relationships, the knowledge necessary to improve bridge performance can be obtained. Cost to the owner agency in terms of inspection, engineering, maintenance rehabilitation, preservation, and replacement. Risk associated with failure of the bridge or a critical element. Property damage, injuries, and fatalities associated with accidents. Delay time and detour costs for commuters, commercial shippers, and tourists due to restricted conditions near or on a bridge. Excess fuel consumption and emissions due to inefficient or extended driving times. Because owner agency resources are often severely limited, it is necessary to examine each issue of bridge performance and weigh the costs of poor performance against the costs of actions necessary to improve performance. This assumes that the causes of poor performance have been determined and solutions are available. Under the LTBP Program, research has been done on evaluating the highest priorities in bridge performance. A consensus has emerged based on expert opinion from owner agencies and other bridge experts. The future results of the LTBP Program will provide knowledge to assist owners in properly making necessary analyses. High-priority performance issues will be outlined in a forthcoming program report, which will identify specific research to be undertaken in terms of objectives, key questions, working hypotheses, and critical data needed. One simple definition of performance is that performance equates to accomplishment of a specified purpose or set of purposes. For the purposes of the LTBP Program, the following definition is used: Bridge performance encompasses how bridges function and behave under the complex and interrelated factors they are subjected to day in and day out – traffic volumes, loads, deicing chemicals, freeze-thaw cycles, rains, or high winds. Bridge design, construction, materials, age, and maintenance history also play roles in performance. Virtually everyone in the United States, from bridge maintenance engineers to the everyday road user, has a stake in ensuring that the performance of bridges is good or excellent in terms of durability, operational capacity, roadway safety, resistance against failure, environmental neutrality, and life-cycle costs. Each group needs to have confidence in their understanding of the indicators by which they measure bridge performance. For the everyday commuter or casual user, an indicator such as Federal SR may suffice. For commercial interests, shippers, and drivers, a simple measure of bridges with posted weight limits or geometrical dimensions may suffice. These groups also need assurance that satisfactory bridge performance is being provided at reasonable costs, as reflected in gasoline taxes, tolls, other roadway fees, and other revenue sources devoted to maintaining performance. Members of the bridge community such as designers, construction engineers, inspectors, maintenance engineers, and bridge management personnel who are responsible for maintaining performance must be able to properly and effectively evaluate bridge performance in more precise and targeted manners. They must break down bridge performance into very specific issues that can be adequately evaluated in terms of cause and effect. This will allow them to identify actions or programs that will ensure a high level of performance at a reasonable cost. This report describes a breakdown of bridge performance issues into four categories of performance: structural condition (for durability and serviceability), functionality (safety and traffic capacity), structural integrity (for safety and stability), and risk and costs to the user and to the agency. This breakdown helps isolate the most critical aspects of bridge performance and provides the basis for long-term research studies that will improve understanding of these issues. Making a proper evaluation of bridge performance can be a formidable task given the many factors that can govern performance under different circumstances. The LTBP Program is being implemented to identify the most critical aspects of bridge performance and conduct studies that will result in the high-quality data necessary to better understand how multiple, variable factors govern those aspects of performance. This effort should ultimately lead to the ability to implement policies and actions for bridge programs that will improve performance and extend the life of bridges at minimum cost. Each bridge in the 2011 NBI is described by an extensive set of characteristics, parameters, and operating conditions, all of which have some impact on some aspect of the performance of the bridge. Table 9 provides a list of the most important of these items. In addition, the age of the bridge is an important contributing factor to the current and future performance of the bridge. However, the simple age in years does not represent a precise measure of the impact of age on performance. The chronological age does not accurately reveal important knowledge about cumulative degradation of material properties, cumulative amount of damage from live loads, and past maintenance and repair history. The average age of all NHS bridges in the NBI is 36.3 years; the average age of all non-NHS bridges is 42.3 years; and the average age of all bridges is 41.0 years. 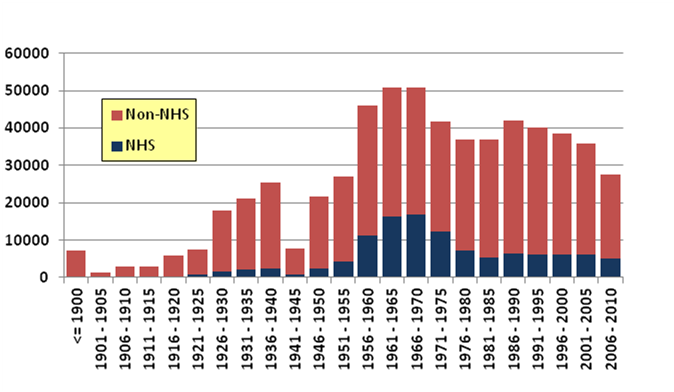 Figure 1 in chapter 1 shows the diversity in age of bridges with a histogram of bridges still in service that were built within 5-year periods. Other critical factors affecting bridge performance are the type, frequency, and effectiveness of preservation, maintenance, repair, and rehabilitation actions performed on bridges by the owner or entity charged with maintenance responsibility. Bridges on public highways are owned by a variety of agency types at different levels of government and by railroads, toll authorities, and other private entities. Table 2 in chapter 1 shows the number of different types of entities that have maintenance responsibilities for bridges on public highways. Based on the 2011 NBI data, the bridge infrastructure in the United States can be further described by table 10, table 11, and figure 50. Note: Table does not include culverts and tunnels. These tables and chart show that while ownership of the vast majority bridges by number is roughly split between State- and local-level agencies, the State-level agencies are responsible for almost 3.5 times as much deck area of bridges. Table 12, table 13, and figure 51 show the variety of bridge types and materials that make up the Nation’s bridge inventory. Table 14 and table 15 show the number and deck area of bridges classified as FO and SD by ownership category. Office of Engineering (1995). Recording and Coding Guide for the Structure Inventory and Appraisal of the Nation’s Bridges, Report No. FHWA-PD-96-001, Federal Highway Administration, Washington, DC. Slater, R.E. (1996). “The National Highway System: A Commitment to the Nation’s Future.” Public Roads, Vol. 59, No. 4, Federal Highway Administration, Washington, DC. Shepard, R.W. and Johnson, M.B. (1999).“California Bridge Health Index.” Presented at the 8th International Bridge Management Conference, Transportation Research Board, Washington, DC. Office of International Programs (2005). Bridge Preservation in Europe and South Africa, Report No. FHWA-PL-05-002, Federal Highway Administration, Washington, DC. Frangopol, D.M., Lin, K-Y., and Estes, A.C. (1997). 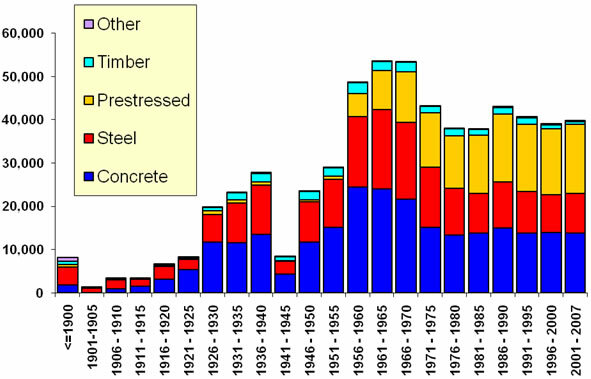 “Life-Cycle Cost Design of Deteriorating Structures.” Journal of Structural Engineering, Vol. 123, No. 10, pp. 1390–1401, American Society of Civil Engineers, Reston, VA.
Frangopol, D.M., Kong, J.S., and Gharaibeh, E.S. (2001). 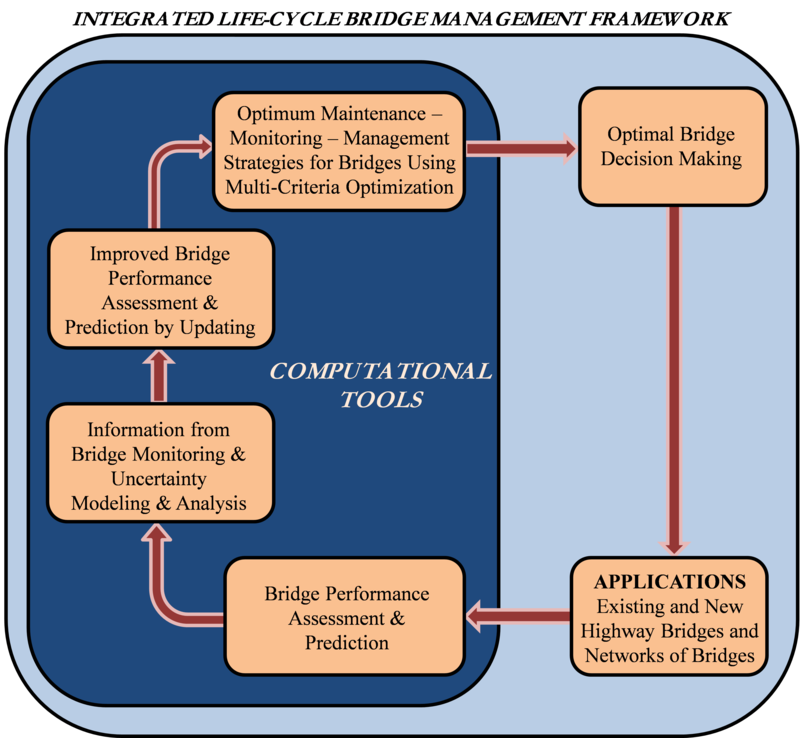 “Reliability-Based Life-Cycle Management of Highway Bridges.” Journal of Computing in Civil Engineering, Vol. 15, No. 1, pp. 27–34, American Society of Civil Engineers, Reston, VA.
Estes, A.C. and Frangopol, D.M. (2005). “Chapter 36: Life Cycle Evaluation and Condition Assessment of Structures.” Handbook of Structural Engineering, Second Edition, W.F. Chen and E.M. Lui (eds. ), CRC Press, Boca Raton, FL. Ang, A.H-S. and DeLeon, D. (2005). “Modeling and Analysis of Uncertainties for Risk-Informed Decisions in Infrastructures Engineering.” Structure and Infrastructure Engineering, Vol. 1, Issue 1, pp. 19–31, Taylor & Francis, Oxford, UK. Ellingwood, B.R. (2005). “Risk-Informed Condition Assessment of Civil Infrastructure: State of Practice and Research Issues.” Structure and Infrastructure Engineering, Vol. 1, No. 1, pp. 7–18, Taylor & Francis, Oxford, UK. Frangopol, D.M. and Liu, M. (2007). “Maintenance and Management of Civil Infrastructure Based on Condition, Safety, Optimization, and Life-Cycle Cost.” Structure and Infrastructure Engineering, Vol. 3, No. 1, pp. 29–41, Taylor & Francis, Oxford, UK. Frangopol, D.M. (2011). “Life-Cycle Performance, Management, and Optimization of Structural Systems under Uncertainty: Accomplishments and Challenges.” Structure and Infrastructure Engineering, Vol. 7, No. 6, pp. 389–413, Taylor & Francis, Oxford, UK. American Association of State Highway and Transportation Officials (2011). AASHTO Guide Manual for Bridge Element Inspection, First Edition, Washington, DC. American Association of State Highway and Transportation Officials (2007). AASHTO LRFD Bridge Design Specifications, Fourth Edition, Washington, DC. Enright, M.P. and Frangopol, D.M. (1998). “Service-Life Prediction of Deteriorating Concrete Bridges.” Journal of Structural Engineering, Vol. 124, No. 3, pp. 309–317, American Society of Civil Engineers, Reston, VA.
Enright, M.P. and Frangopol, D.M. (1998). “Failure Time Prediction of Deteriorating Fail-Safe Structures.” Journal of Structural Engineering, Vol. 124, No. 12, pp. 1448–1457, American Society of Civil Engineers, Reston, VA.
Frangopol, D.M. and Messervey, T.B. (2009). “Life-Cycle Cost and Performance Prediction: Role of Structural Health Monitoring.” Frontier Technologies for Infrastructures Engineering, S–S. Chen and A.H-S. Ang (eds. ), CRC Press, Boca Raton, FL. Frangopol, D.M. and Messervey, T.B. (2009). “Maintenance Principles for Civil Structures.” Encyclopedia of Structural Health Monitoring, Vol. 4, C. Boller, F-K. Chang, and Y. Fujino (eds. ), John Wiley & Sons Ltd, Chicester, UK. American Association of State Highway and Transportation Officials (2002). AASHTO Standard Specifications for Highway Bridges, 17th Edition, Washington, DC. Cohn, M.Z. (1980). Nonlinear Design of Concrete Structures: Problems and Prospects, University of Waterloo Press, Ontario, Canada. Ang, A.H-S. and Tang, W.H. (2007). Probability Concepts in Engineering. Emphasis on Applications to Civil and Environmental Engineering, Second Edition, John Wiley & Sons, Hoboken, NJ. Mori, Y. and Ellingwood, B. (1993). “Reliability-Based Service-Life Assessment of Aging Concrete Structures.” Journal of Structural Engineering, Vol. 119, No. 5, pp. 1600–1621, American Society of Civil Engineers, Reston, VA.
Frangopol, D.M. and Curley, J.P. (1987). “Effects of Damage and Redundancy on Structural Reliability.” Journal of Structural Engineering, Vol. 113, No. 7, pp. 1533–1549, American Society of Civil Engineers, Reston, VA.
Frangopol, D.M. and Klisinski, M. (1989). “Material Behavior and Optimum Design of Structural Systems.” Journal of Structural Engineering, Vol. 115, No. 5, pp. 1054–1075, American Society of Civil Engineers, Reston, VA.
Frangopol, D.M. and Klisinski, M. (1989). “Weight-Strength-Redundancy Interaction in Optimum Design of Three-Dimensional Brittle-Ductile Trusses.” Computers and Structures, Vol. 31, Issue 5, pp. 775–787, Pergamon Press, Oxford, UK. Frangopol, D.M. and Klisinski, M. (1992). “Design for Safety, Serviceability and Damage Tolerability.” Designing Concrete Structures for Serviceability and Safety, Document No. SP133–12, American Concrete Institute, Farmington Hills, MI. Frangopol, D.M., Klisinski, M., and Lin K.Y. (1996). “Incorporating Damage Control in Structural Design.” Building an International Community of Structural Engineers, Vol. 1, pp. 598–605, American Society of Civil Engineers, Reston, VA.
Fu, G. (1987). Modeling of Lifetime Structural System Reliability, Report No. 87–9, Department of Civil Engineering, Case Western Reserve University, Cleveland, OH. Frangopol, D.M. and Nakib, R. (1991). “Redundancy in Highway Bridges.” Engineering Journal, Vol. 28, No. 1, pp. 45–50, American Institute of Steel Construction, Chicago, IL. Frangopol, D.M. and Okasha, N.M. (2008). “Life-Cycle Performance and Redundancy of Structures.” Proceedings of the Sixth International Probabilistic Workshop, pp. 1–14, Darmstadt, Germany. Okasha, N.M. and Frangopol, D.M. (2010). “Time-Variant Redundancy of Structural Systems.” Structure and Infrastructure Engineering, Vol. 6, Nos. 1–2, pp. 279–301, Taylor & Francis, Oxford, UK. Lind, N.C. (1994). “A Measure of Vulnerability and Damage Tolerance.” Reliability Engineering and System Safety, Vol. 43, No. 1, pp. 1–6, Elsevier, Amsterdam, Netherlands. Ghosn, M., Moses, F., and Frangopol, D.M. (2010). “Redundancy and Robustness of Highway Bridge Superstructures and Substructures.” Structure and Infrastructure Engineering, Vol. 6, Nos. 1–2, pp. 257–278, Taylor & Francis, Oxford, UK. Tierney, K. and Bruneau, M. (2007). “Conceptualizing and Measuring Resilience.” TR News, No. 250, pp. 14–17, Transportation Research Board, Washington, DC.